PARKING IN PORTO? WHERE SHOULD I PARK IN PORTO? Searching for parking in a European city can become a nightmare, and parking in the city of Porto isn’t different. But calm down, we will help you, and you'll become a real expert in finding cheap parking close to the main areas that you should visit in Porto. As you certainly know, the hourly rate can vary widely depending on where you want to park your car, whether it is a parking lot managed by public or private entities, indoors or outdoors, with or without surveillance. 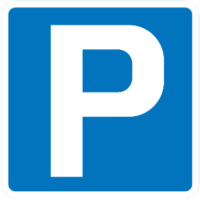 Therefore, the hourly parking rates, in the city of Porto, are around 0.8€/hour and 2.60€/hour. BUT WHERE SHOULD I PARK IN PORTO? We will help you answer that question, but first of all, our suggestion is to always use the Porto metro, it is a great way to get around, easy, cheap and with stations near the main places to visit in Porto. Secondly, you need to know which area you want to visit. The cheapest parking lots are the ones managed or owned by the Porto City Hall (CMP), but just because they are cheaper, doesn’t mean they are in "far from everything" zones, quite the contrary, we will tell you some that are in fantastic areas of Porto and from where you can visit the city calmly. In Porto, street parking is only paid on working days.